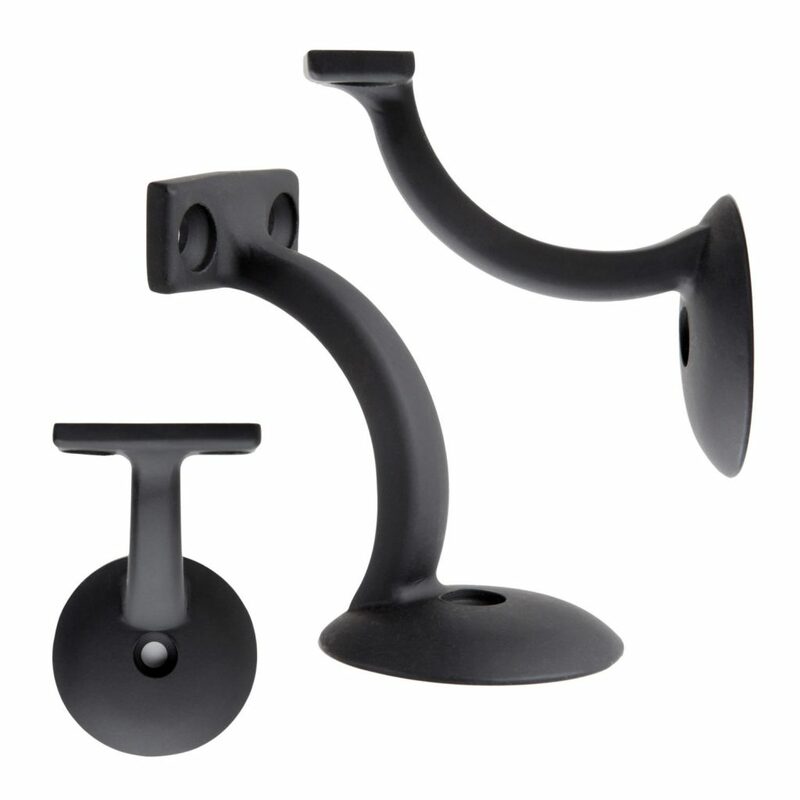 The above products are recommended for installation or mounting of the Classic Handrail Bracket. Are there three brackets per package, or just one? The brackets are sold individually. The image is just intended to give you multiple views of the bracket. We typically recommend you use one on each end, and then an additional every 4 feet. do they require any specific screws and or do they come with the recommended screws? These come with the screws we recommend for mounting the bracket to a stud. If you can’t hit a stud, you’ll need to purchase a different type of anchor. I don’t know the exact material that they are made of, they are some type of iron. I don’t know the PSI load capacity of the brackets, but we recommend that you put one at least every 4 feet. We’ve been selling these for 10 years plus, and never had any issues with them failing. Are the brackets also made in the USA? Unfortunately they are not. All of our wood products are made in house, but a lot of the small hardware items are imported. how long are your stud bolts for anchoring the handrail bracket? The screw that goes into the wall is 2″ long, the screws that go into the handrail are 1 1/4″. Hi. Will these work with the 6000 model handrail? Thank you. Yes, these will work just fine with our 6000 handrail. Hi, what would I need in order to attach these onto brick? You would want to go to a local hardware store and pickup a anchor that is designed to go into brick. Unfortunately what we provide only works with wood. Classic Handrail Bracket — I am installing Model #3008 on a 1-1/4″ square metal tubing handrail. What is the WIDTH & LENGTH of the top piece with the 2 holes? I see that “The screw that goes into the wall is 2″ long, the screws that go into the handrail are 1 1/4″.” What are the DIAMETERS of the screws? Can I paint the brackets to match the handrail? The width & length of the top portion is: 1 3/4″ long and 3/4″ wide. Here are the dimensions on the screws: 2″ = 5/32″ & 1 1/4″ = 1/8″. Also, yes the brackets can definitely be painted to match the handrail. The 3021 bracket has a standard powder coating finish on it that isn’t designed to be used outdoors. The 3021E has a special powder applied that is designed to hold up outdoors. The finish is similar, but the 3021E has more of a sheen than the standard 3021. The brackets will be installed on a concrete structural wall. What type of fastner do you have for this application? Thank you for asking, Robert. We currently only offer wood screw fasteners. We would suggest sourcing similar concrete screws from your local home improvement store. Can the brackets be stained to achieve a weathered look? If so what would be the best the material for staining them (oil or acyclic base). I plan on starting with the polished “brass” finish. We haven’t heard of anyone trying to weather the brackets before. Generally, the Antique Brass and Antique Nickel brackets have a weathered look that people enjoy. You could certainly try to weather the Brass finish, but unfortunately, we don’t have any suggestions on how to go about that. If you have any other questions we might be able to help with, don’t hesitate to ask. Would this work with the 6040 Round Handrail? If so, which plow would it call for – 1″ or 1.25″? Thank you for your questions! Yes, these handrail brackets will work with 6040 Round Handrail. The handrail will not require a plow to work with the handrail brackets. A plow is only required if you are using wooden balusters, in which case, the size of the plow is determined by the size of the baluster. Thanks! Though the classic handrail bracket is a standard 2-5/8″ standoff from the wall, we may be able to provide you with a custom solution. We’d recommend giving our team a call at 1 (866) 226-6536 to see what kinds of solutions are possible. What are the dimensions of this product? I’ve looked everywhere I could think of and can’t find them. 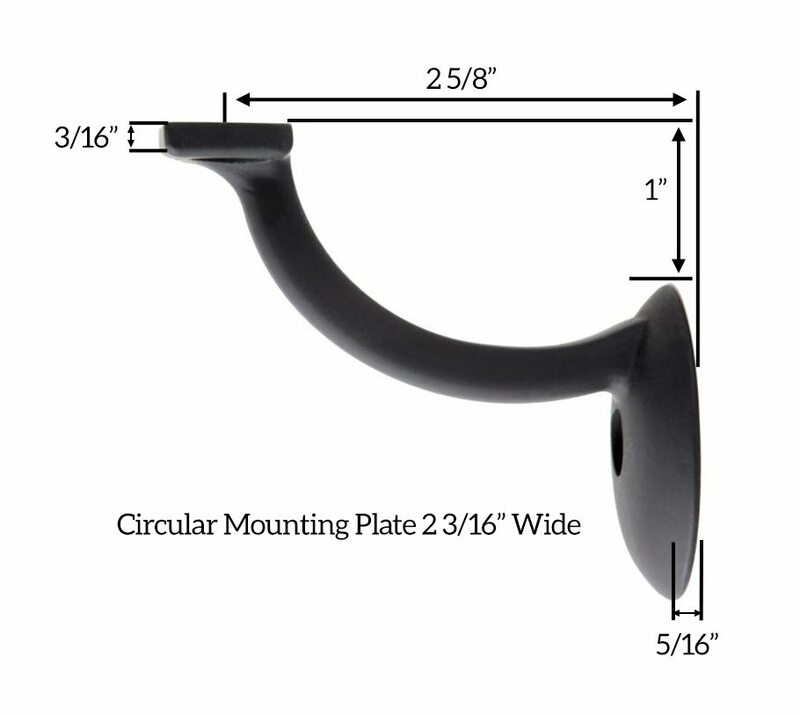 The Classic Handrail Bracket is 2-5/8″ from mounting surface to the center of the mounted handrail with a 1″ vertical standoff. The circular mounting plate is 2-3/16″ Wide, and 5/16″ thick. If you have additional questions about this product, give our team a call at 1 (866) 226-6536. How many brackets are needed for an 18″ handrail? We typically recommend you use one on each end, and then an additional bracket every 4 feet.